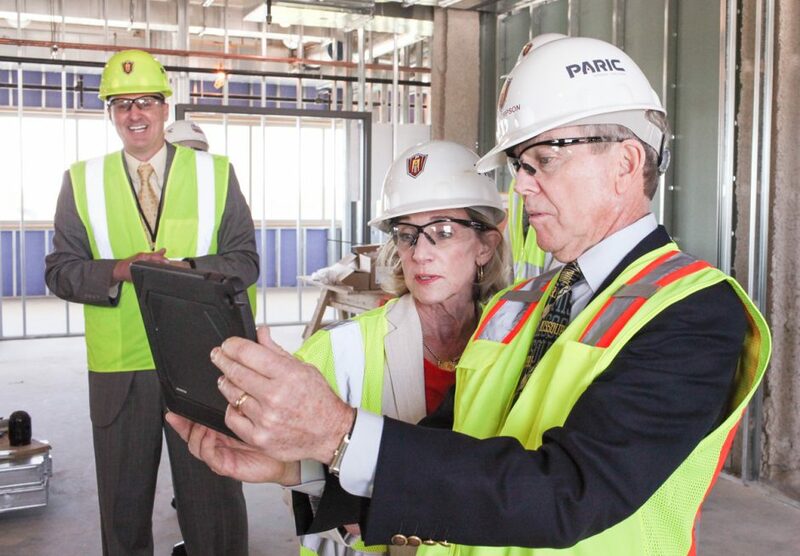 Bill and Nancy Thompson view a rendering of the Thompson Regenerative Orthopaedics Laboratory while on a tour of new construction in MU's Missouri Orthopaedic Institute, with Jimi Cook (left), director of orthopaedic research. “Do you know what the ‘regenerative’ in ‘regenerative orthopaedics’ means?” asks an excited Bill Thompson. His eyes are wide behind his clear safety glasses; his eyebrows climb up his forehead, hugging the bottom of the white hard hat that covers his graying hair. 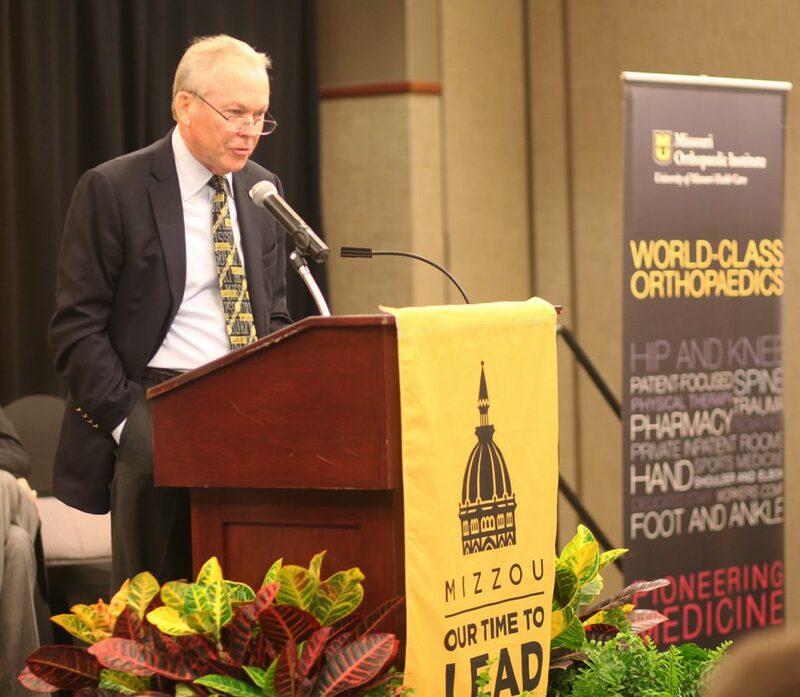 Thompson, BS CiE ’68, turns to Jimi Cook, the William and Kathryn Allen Distinguished Professor of Orthopaedic Surgery and director of the Orthopaedic Research Division at MU. Cook is leading a group of 17 donors, visiting doctors and media on a tour of the still-under-construction fourth floor of the expanding Missouri Orthopaedic Institute (MOI). The fourth floor will essentially be Cook’s laboratory. Bill Thompson speaks during a gift announcement for the Thompson Regenerative Orthopedics Laboratory. A $3 million gift pledged from the Thompson Foundation will help expand the Missouri Orthopaedic Institute. The $40 million MOI expansion would have been just three floors. 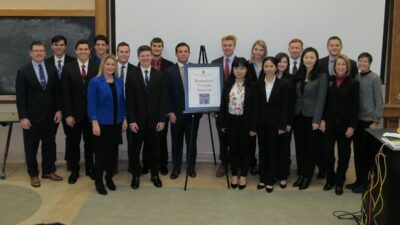 It’s only because of a $3 million gift from Bill and his wife, Nancy Thompson, HES ’67, that the fourth floor — Thompson Regenerative Orthopaedics Laboratory — will exist. Thompson is no stranger to accomplishing special things at Mizzou. In 2005, his $8.5 million gift helped establish the Thompson Center for Autism and Neurodevelopmental Disorders, now a national leader in the diagnosis and treatment of autism spectrum disorders. His hope for this gift is to boost the scope and quality of care at MOI to world-class heights. 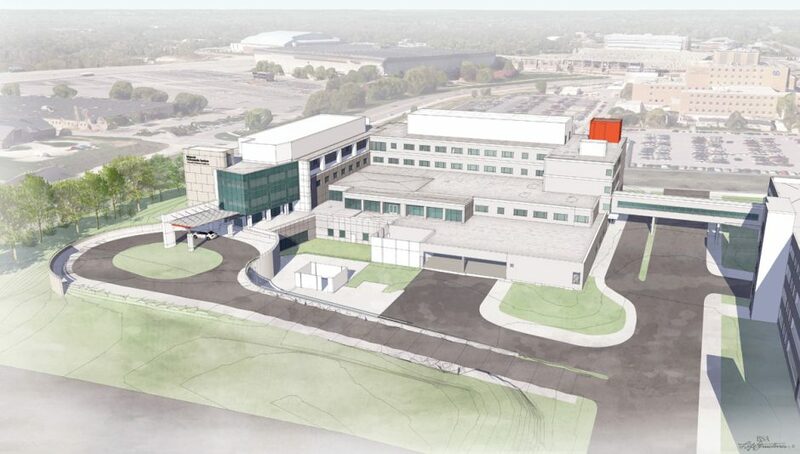 A rendering of the Missouri Orthopaedic Institute. The expansion will increase MOI’s floor space from about 114,000 square feet to about 200,000 square feet and will add 19 outpatient examination rooms, 22 inpatient rooms and as many as five operating rooms. The regenerative approach Cook and MOI are pioneering is a quantum leap forward in quality of life for patients with joint replacements. Standard practice for joint replacement is to use metal and plastic parts, which are inherently limiting, uncomfortable and prone to degradation. Cook's idea is to replace damaged joints with the body's own tissue by growing cartilage cells in a high-tech mold. He has already used the procedure in dogs and is pursuing approval for use in humans. What they do now in humans is use a patient’s own bone marrow stem cells to “seed” a joint transplant. Joint tissue can be transplanted the same way organs can, and the presence of a person’s own cells reduces the risk that the body will reject the donated tissue. Cook also is completing work on a much-improved preservation system that will triple the amount of time donated tissues remain viable for transplant and make them easier and less costly to store. In the new center, lab researchers and clinical practitioners will be housed together so that challenges and insights gleaned from the operating room can easily flow to the research bench and vice versa.